Melt together the coconut oil, cacao powder, stevia and salt. Add and mix in the almond butter. Place the almonds and toasted coconut flakes in a sealable glass tupperware container, pour in the melted mixture and toss well to ensure everything is coated. Add the coconut sugar, cover and shake to coat. Now add the arrowroot powder, cover and shake well. If the chocolate is too moist and keeps absorbing the arrowroot powder, set the dish in a the fridge for about 10 minutes to help the chocolate firm up, then add a bit more powder and shake. Store in the fridge for best freshness. 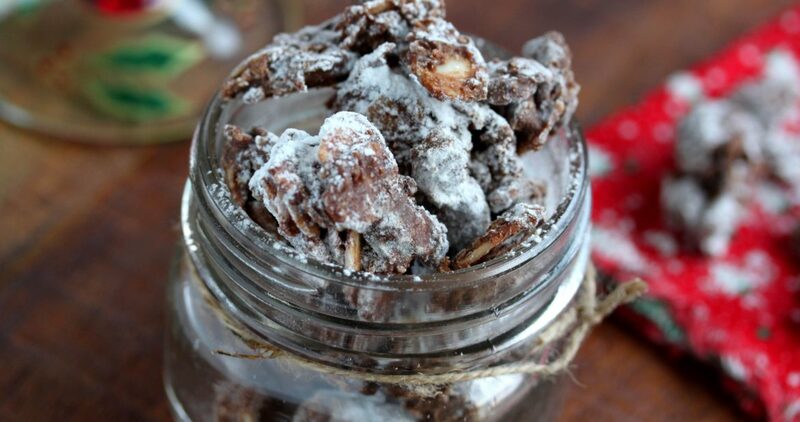 My version of puppy chow has all the flavor without all the chemicals and fat. It’s chocolatey, creamy and crunchy. Some of the almonds and coconut will stick together, which helps to great a little crunch like you would get if you made this with cereal. Using raw cacao powder offers a ton of minerals like magnesium, iron and calcium because it’s much less processed than cocoa powder. The coconut sugar is a little less sweet than white, processed sugar, it’s lower on the glycemic index (so won’t give you that sugar rush white does) and it retains more nutrients too. Arrowroot coats the whole thing with white powder, so you get the same effect as powder sugar. Perfect for a little pick me up anytime and great as a Holiday gift- just place in a cute jar and add a ribbon and a label.